A natural gas campaign that doesn’t lead with natural gas? Genius. Welcome to “Natural Gas. Genius.” — a consumer marketing campaign that speaks from the heart and mind of today’s homebuyer/remodeler. It’s refreshing, sassy and right on target with this target audience. In each component of the campaign, we experience people’s stories that show us how they are transforming into providers of better living for themselves and those they love because they are choosing natural gas. The voice of the campaign comments on this transformation, acknowledges the “genius” moves these people are making and encourages them to do more with natural gas — all while poking a little fun and laughing with them about who they used to be and how far they have come. The campaign look shows a primary photograph of the person in the story, with several smaller images that give us glimpses into the person’s family and friends and the warm, cozy, comfortable, fun moments they are enjoying enabled by natural gas. Consider this your owner’s manual for the “Natural Gas. Genius.” campaign. Here, you’ll find all the basic “rules of the road” for customizing existing campaign materials or creating new campaign-related assets. By always using the campaign elements as specified, you will be helping to maintain consistency across all media channels, thus strengthening the campaign’s reach and effectiveness. Access the campaign style guide here. View the briefing webinar here (APGA Members only). 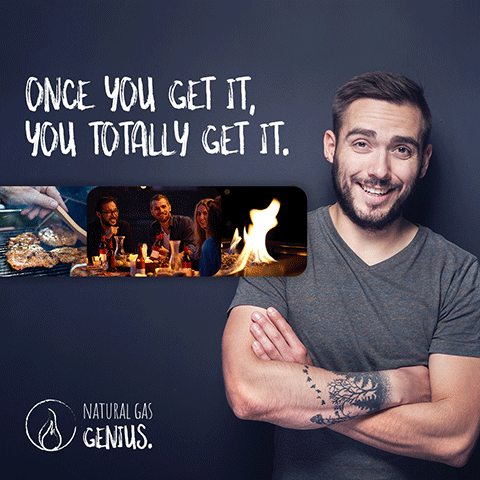 Access the Natural Gas Genius creative assets here (APGA Members only).